Remember back in the day when “winter white” had a yellowish tinge? Today’s version gives us beautiful options from icy to creamy whites. Thank goodness for that…right? Last fall, I won the “Diva” auction package at the Samaritan House Gala, and one of the items was a gift card from Climate located in Clearfork (Mountain & Ski Apparel). So I bet you are wondering what this “Diva” purchased with her “Diva” gift card? Drum roll please….that would be a white “Diva” jacket by prAna! It’s also the perfect transition jacket and complements all the spring hues. Imagine a cloud. Then imagine the feeling of being wrapped in a cloud! That’s what wearing a super soft and cozy pullover fleece/Sherpa feels like…perfect for days when the temperature drops. We love how it complement a pair of white jeans. And think a pair of Sorel boots is the “white icing” on the cake! Plus, they make for a great athleisure look when worn with leggings. A winter-white vest pretty much goes with everything. 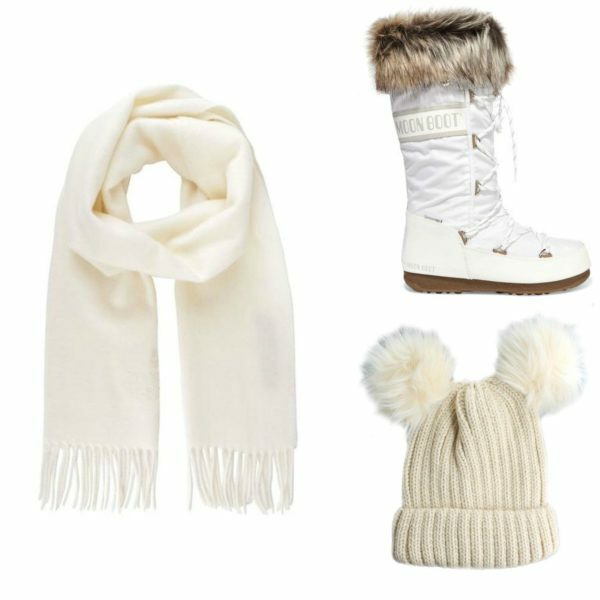 Wanting to winterize your preppy style a bit? A Sherpa/fleece vest will give you the look you are wanting. 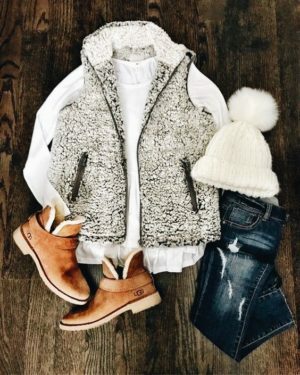 An adorable ensemble on our Pinterest board shows a winter white fleece vest with a white long sleeve t-shirt, distressed jeans, UGG boots and….for extra-preppy cuteness….they added a white knit beanie cap! 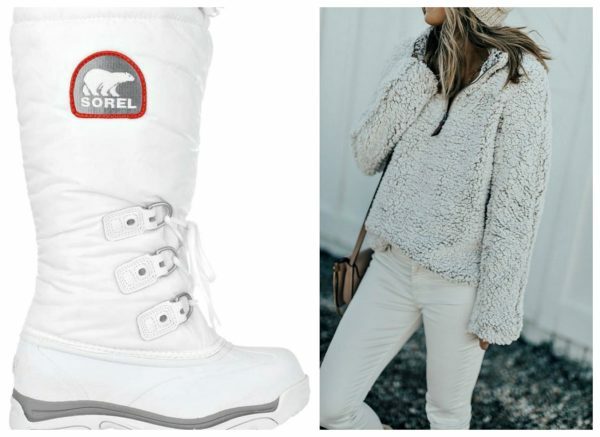 Another way to add winter white to your look is with boots and accessories. Again, a beanie cap is a must for the ski slopes and city walking. Rubber boots are also a ski resort necessity. 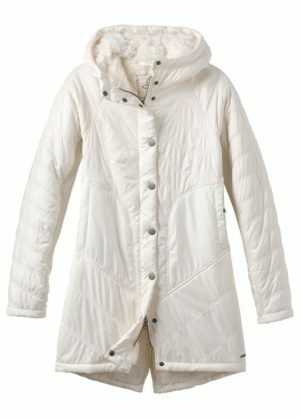 Macy’s has a great selection of Sperry and UGG winter boots, and they even come in winter white! 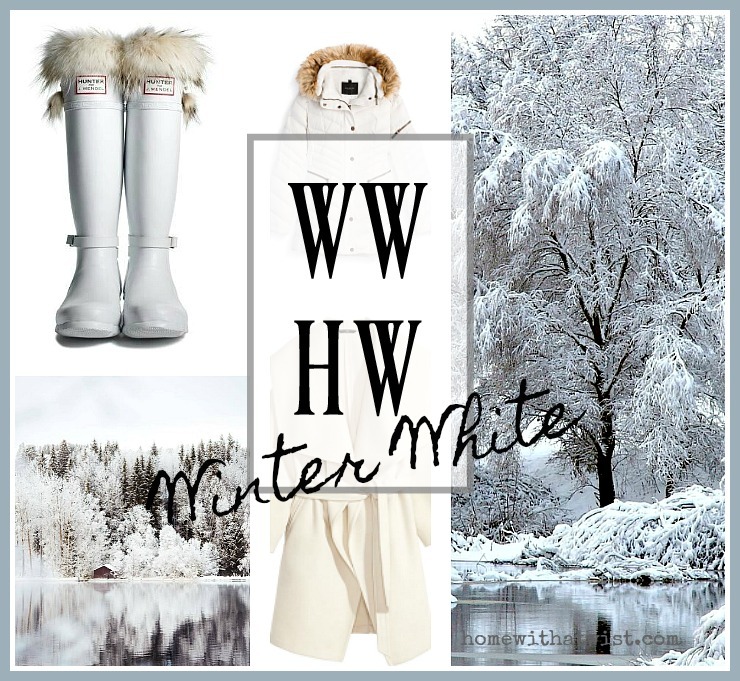 For a snowy day, we suggest a pair of white Hunter boots with fur liners…of course! And please know, a white scarf or poncho is a great way to wrap up your winter style! For me, a white sweater paired with white jeans lifts my winter spirit. The “Fab over Fifty,” blog demonstrates a great way to style a white knit poncho over a long-sleeved white tee and jeans. A creamy white cable-knit sweater goes with just about everything and looks especially cool half-tucked in a pair of white jeans. And here’s the good news….your whites do not have to match! How awesome is that? So from fluffy scarves to heavy-duty rubber boots, we think the best way to add warmth to your cold weather style is with a beautiful winter white! Don’t you agree?